Sunday July 14th 1901 Weather very warm. I read and wrote some in the evening and slept most of the afternoon. We sat on the porch till bed-time. 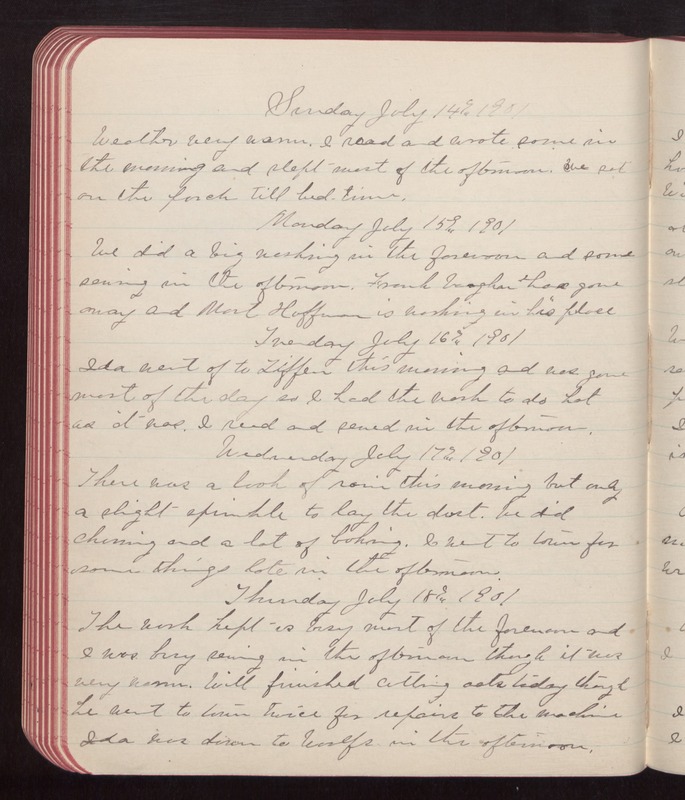 Monday July 15th 1901 We did a big washing in the forenoon and some sewing in the afternoon. Frank Vaughn has gone away and Mort Huffman is working in his place. Tuesday July 16th 1901 Ida went of to Tiffen this morning and was gone most of the day so I had the work to do hot as it was. I read and sewed in the afternoon. Wednesday July 17th 1901 There was a look of rain this morning but only a slight sprinkle to lay the dust. We did churning and a lot of baking. I went to town for some things late in the afternoon. Thursday July 18th 1901 The work kept us busy most of the forenoon and I was busy sewing in the afternoon though it was very warm. Will finished cutting oats today though he went to town twice for repairs to the machine Ida was down to Woolfs in the afternoon.